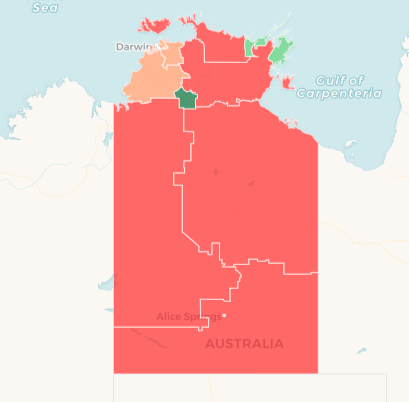 Northern Territory electoral boundaries are redrawn every four years, and electorates need to fall within 20% of the quota (one-25th of the total electors). The new boundaries will apply at the August 2020 election. The following map shows the variance from the quota by seat. Green means over, red means under. The biggest deviation is in the Alice Springs area. There are only two electorates in the Alice Springs area, with the third Alice seat abolished after the 2012 election. Braitling is a whopping 29% over quota, while neighbouring Araluen is 17.3% over quota. These are the two biggest electorates in the Territory. Only one other seat is more than 10% over quota: Katherine, which is 10.2% over quota. These would traditionally be considered some of the safe Country Liberal seats in the Territory, although the landslide election result in 2016 saw the CLP lose all three, with an independent winning Araluen and Labor winning Katherine and Braitling. Still, you’d expect these seats to revert to the CLP at a competitive election. In contrast, the outback seats of Namatjira, Stuart and Barkly, as well as the large Top End seats of Arnhem and Arafura, are all under quota by at least 10%. These five seats only have enough population for 4.37 seats. There is less variation in the Darwin-Palmerston area – no seat is out of quota by more than 10%, and the 14 seats are collectively over quota by about 10% of a seat. So the changes in the Darwin-Palmerston area need not be dramatic. The three rural seats of Nelson, Goyder and Daly which surround Darwin are under quota by about the same amount as the Darwin-Palmerston area is over quota, so any changes in this area need not have flow-on effects. The big question is what to do in Alice Springs. Thanks to the delay in me analysing this topic, we already have submissions from 14 different entities, which were published on Friday March 29. Labor and the Country Liberal Party both made complete detailed submissions, and neither of them recommended recreating a third Alice seat. In contrast, the local Alice Springs branch of the CLP did recommend such a change, without making detailed suggestions. The last NT election was a massive landslide, with the then-government reduced to only two seats, alongside five independents and 18 Labor members (since reduced to 15 members). In these circumstances the exact boundaries don’t matter, but they could make a difference if the CLP can make a comeback. With three Labor members now sitting on the crossbench, the loss of only three seats could be enough to push the Labor government into minority, so the boundaries of Alice Springs and outback seats could be crucial. Comments on submissions close next Monday, April 15. After this point, the Electoral Commission will publish draft boundaries, followed by two rounds of objections and comments before final boundaries will be published. I expect the process to be concluded this year. Crying out for some proportional representation… Alice Spring spring voters worth half those of the area surrounding, yikes. Not to be rude, but the ALP submission has very poor spelling and grammar. Was it written in a hurry? The problem is they aren’t all 5s and it isn’t easy to see the 5. Just picking groups of 5 of the current electorates definitely doesn’t work. You also get a situation of very remote areas that would be hard to get the attention of the “local” MP as they battle over larger towns. Tiny electorates may be a necessary evil.